Not a bad Wednesday night for the New York Ranger and New York Islander prospects who saw action as their teams all came away winners thanks to their play. Anthony Duclair (NYR 2013 3rd) has been struggling as of late, taking penalties that have hurt his Quebec Remparts. 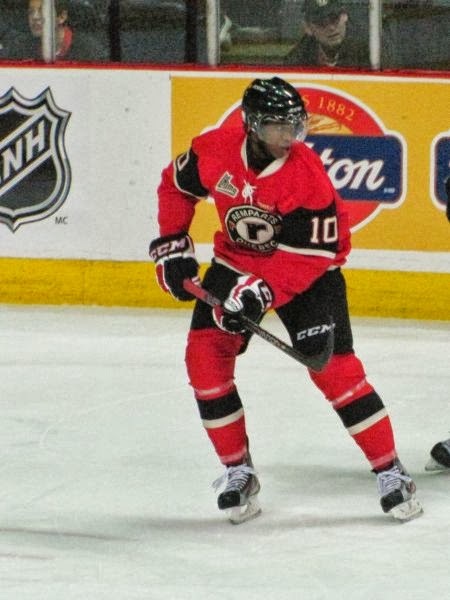 Wednesday night Duclair was the reason why his Quebec Remparts defeated the Baie-Comeau Drakkar 4-2. Duclair had a 3 point night (2-1-3) with all 3 points coming on the power play to earn first star of the game honors. First Duclair set up Quebec's Alexandre Boivin for Boivin's first goal of the season on the power play just 3:13 into the game. In the 3rd period with the score tied at 2-2, it was Duclair scoring his 6th goal of the season while the Remparts had a 5 on 3 power play at 14:03. The goal would prove to be the game winning one but Duclair wasn't finished as with Quebec still on their 6th power play of the night, Duclair made it a 4-2 lead with his 7th goal of the season just 50 seconds later at 14:53 as the power play was expiring. Quebec earns just their 2nd win of the season as Duclair with his 1st game winning goal of the year improves to 7-4-11. It was the 3rd game with 2 goals for Duclair out of 8 games played so here is hoping he keeps it up. Duclair also earned the Yahoo "Buzzing the Net" 3rd star of the night for his play. Adam Pelech (NYI 2012 3rd)made sure that his first OHL career game winning goal was one that was going to be remembered. Pelech scored with just 2.4 seconds remaining in regulation to give his Erie Otters a 3-2 win over the visiting Owen Sound Attack. Granted Pelech is not a huge goal scorer with this goal being just the 12th goal in 175 OHL career games, the goal helps his Erie Otters improve to 4-2-1 on the season after the Otters have won 2 straight. Teammate Troy Donnay (NYR 2013 UFA) didn't have as dramatic a scoring play as Pelech did but his 1st point of the season was a secondary assist on a shorthanded goal which gave Erie a 2-1 lead. Mackenzie Skapski (NYR 2013 6th) earned his 3rd win of the season stopping 25 out of 27 shots as Skapski's Kootenay Ice defeated the Lethbridge Hurricanes 5-2. Skapski's teammates made this an easy win for him as they rocked Lethbridge for 41 shots. Skapski with his 2nd straight win improved his record to 3-2-1, lowering his goals against to 3.30 and improving his save percentage to 0.900. In case you did not hear, the Islanders returned Griffin Reinhart to the Edmonton Oil Kings on Wednesday which is going to change the balance of power in the WHL's Eastern Conference.